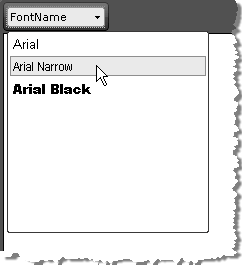 The WYSIWYG Fonts dropdown of RadEditor display a predefined set of fonts which by default are: Arial, Comic Sans MS, Courier New, Tahoma, Times New Roman and Verdana. All fonts are set using the FontNames Collection. You can create a new set of dropdown Font name items declaratively, programmatically or using the ToolsFile. Use the FontNames collection Add() method to include new fonts in the list. When first using the Add() method, the Fonts dropdown will be reset, so the fonts you add will not be appended to the default set, but will rather create a new Fonts set. Bear in mind that RadEditor will persist its state (including the Fonts set) between postbacks. In order to create a new set of Fonts (e.g. for different users), you will need to clear it first. This can be done using the FontNames collection Clear() method to remove all elements or Remove() to remove specific fonts from the collection.